Trees have roots, people have legs, ideas have wings. An introduction. Taking a philological field trip in 1837 by A.H. Hoffmann von Fallersleben as an example, this essay demonstrates how the rise of medievalism and national philology in the Netherlands was not a homegrown development, but a result of Dutch-Flemish, Flemish-German and Dutch-German cross-currents. The sample case is used to demonstrate various approaches in transnational history. Polysystem theory, Cultural Transfer, histoire croisée, innovation-diffusion modelling and Actor-Network Theory are all useful correctives to infrastructural determinism. But the implict capacity of culture to communicate and disseminate itself beyond its context of origin (already reflected in the ninth-century manuscript discovered by Hoffmann on his field trip) should be recognized as a fundamental starting point in all historical research. The statistical travels of Jan Ackersdijck. This contribution analyzes the different stages of the scientific travels of Jan Ackersdijck (1790-1861), professor of law, history, statistics, and political economy at the Universities of Liège and Utrecht. Prior to the late 1840s, the journeys of Ackersdijck fit in with the model of traditional, eighteenth-century scientific travelling, also known as ars apodemico. In the last 15 years of his life however, he participated in a number of international scientific congresses. These congresses were a new form of knowledge exchange, that significantly expanded in the second half of the nineteenth century. Isaac Warnsinck, Karl Friedrich Schinkel and the reform of Dutch Architecture around 1840. Isaac Warnsinck (1811-1857), a young Dutch architect, visited Germany on a grand tour through Europe in 1838-1839. During this journey, architectural history captured his attention, as he searched for inspiration for a new, genuinly Dutch architecture. With other Dutchmen, he shared the view that this Dutch architecture had to be an amalgam of tradional Dutch soberness and a new need for architectural representation after the secession of Belgium from the Netherlands in 1831. Warnsinck found this kind of ‘quiet grandeur’ in the buildings of the Prussian architect Karl Friedrich Schinkel, whom he visited in Berlin. Back home, Warnsinck tried to introduce the Prussian model into the Netherlands. Tangible ties. The introduction of the Braille system in the Netherlands. In 1837 the Braille system was introduced at the Institute for the Education of the Blind in Amsterdam. In the long run the use of Braille made all kinds of printed matter accessible to blind people, thus becoming an important means for their social and intellectual integration. The quick spread of Braille resulted from the vast international network of institutions for the blind, which made a lively exchange of educational experiences possible. Until about 1890 however, the Braille system, in the Netherlands as in other countries, was primarily used for writing. Only after the improvement of printing techniques and the establishment of special libraries Braille became the main method for reading too. Foreign examples, 1865-1880. Proposals to modernize Dutch culture according to a French or German model in the writings of C. Busken Huet and J. van Santen Kolff. The reduction of the Netherlands to a minor European power after 1830 resulted in a protracted crisis in the Dutch sense of national identity. In the 1860s and 1870s several writers proposed a modernisation of the arts and public opinion in the Netherlands according to a cultural model derived from one of the neighbouring countries. C. Busken Huet insisted on following the centralized and authoritarian model of the French Second Empire, whereas J. van Santen Kolff looked at the combination of nationalism and ‘realism’ (which in his opinion included Wagnerian symbolism) current in contemporary Germany. Disappointed by the indifference with which their proposals were received, they finally left the Netherlands and settled in the respective countries they endorsed as examples. Although their remedies were not fully applied, both writers did make a major contribution to the renewal of cultural life in Holland. ‘O, may the same, noble feeling excite us, too!’ The benevolent hand of the Toynbee-movement. In the range of initiatives that were started to solve the ‘social question’ in the last quarter of the 19th century, the social program developed at Toynbee Hall in London became a source of inspiration for reformers all over the world. For many reformers this kind of social work – offering education and civilisation, based on personal contact – seemed the right answer to solve the distinction between the classes. Often inspired by a visit to Toynbee Hall, a network of Dutch reformers (m/f) eagerly transferred the idea to the Netherlands, creating a specific Dutch version of an international ideal. International theatre traffic in late nineteenth century. The case of Marie Kalff. Dutch theatre culture has always been internationally oriented. In the nineteenth century, theatre artists from the Netherlands keenly kept up with the latest trends on the stages of Paris and Berlin, and established ties with actors, directors and managers from abroad. Still, this international exchange rarely proceeded without difficulties. 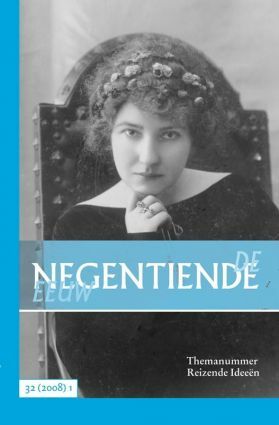 The Dutch actress Marie Kalff, who between 1899 and 1903 served as a mediator between Dutch and French theatre culture, made several attempts to introduce French symbolist theatre in the Netherlands. She failed. Only years later, other intermediaries, oriented towards England and Germany rather than France, succeeded in putting symbolism on the map.